Hello Precious Ones. 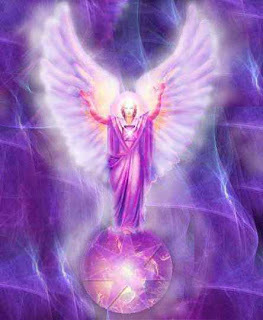 I AM Zadkiel, Archangel of the almighty violet flame, the flame of truth and purification. Many of you know me. I hover around you lately and assist with purification and transmutation. You are all clearing in immense leaps and bounds these days, and you have required much assistance of many in the Celestial and Galactic Realm to boost your awareness and boost your abilities to clear and transmute to reveal the true essence of You that is emerging ever steadily and true. As you survey your “Kingdom of Truth”, you have been privy to many new insights and remembrances of what you are composed of and what you are made of and what your purpose is. And albeit difficult at times to encompass all that you are, without being blocked by expectations and qualifications, you are proceeding nicely along this path of ever-expansion into who you truly are. You see, you are made up of so many things, but yet you are made up of simply the frequency of LOVE. And not so simply as yet. Many of you have been dipping into the deep deep reservoir of their Love Essence as it has been made itself more present and obvious that you are swimming in it, that you are encompassed by it, and that yet you encompass it at the same time. It has always been there, but not so obvious. There has been a wall, invisible at best, but a wall that signified separation, the theme of the day for many many eons. As you know, the walls are coming down, breaking down, crumbling down, and with it comes a rush of this deep reservoir of LOVE and True Essence of your Divinity to flood your awareness, and to be your present truth. You only have to allow the awareness, to be overcome by the reality of it, dear ones. And so I beseech you to continue to allow these walls to continue to crumble, these walls of separation that used to define how you look at things, that used to be your only world. You have merely adopted and taken on that way of looking at things for many many eons. It is time for you to open the curtains of your Soul and realize the immensity of your expansive world out there, made possible by your perception from within. And so that you do not think I am talking with riddles, consider this: You are so immense, you are so expansive, that at one time you were content to house it in a small physical vehicle and a small frame of reference. like miniaturizing what you really entail. And now that the walls are lifting and your rendered “smallness” has given way and begun to expand back up to full-size Divinity, it is coloring everything differently. And it will merely take some time to adjust, to get used to your new “eyes” and to also clear them of the sleepiness you have endured for a long long time. And so dear ones, I come to you to remind yourselves of your progress in this, of your utter courage and bravery to let all walls and veils disintegrate to expose the rawness, but beautiful essence, of your Soul and Divinity. Congratulations…we know it has not been easy for you. But just as a baby takes time to grow from the tiny cells of its emergence into physicality, you take time to “grow” into your new body, which is now composed of not only your physical vehicle, but all the aspects of your True Being. The integration is moving quickly for many of you and morphing beyond what your “mind” can comprehend at times. Just allow the emergence, just allow the metamorphosis, and let it take the twists and turns it is meant to. For that you will be grateful. For it will allow you to be adapted to the frequencies of On High and give you more and more a taste of what we in the Celestial and Galactic Realm experience daily: the sweet music of the Soul, the sweet music of our Divinity. You are there amongst us and you are not far from the full expression of it. Take this all in, dear ones. Allow for mistakes and twists and turns in your emergence. The road always leads to the same place as long as you remain open and loving to yourselves. And very shortly, you will turn the corner to reveal a bigger more expansive reality and world that you will feel so much at Home in. It only requires your perseverance and your allowance of every new venture that beckons you in your Now Moment that speaks of Love and Wholeness. I bid you farewell for the moment but I shall return again, and I AM always in your field if you beckon and allow me. Much, MUCH love, light, and hugs, dearest Fran! Bright Reiki Blessings to you, Fran. Have a beautiful weekend. Namaste.